Bauhaus: Art as Life, on view at the Barbican Art Gallery in London, seeks to showcase not only the exceeding wealth of artistic production from this legendary school, but moreover to engage inspection of the cultural climate within which the foundation of modern design blossomed. The comprehensive collection of over 400 works, mined largely from the Bauhaus-Archiv Berlin / Museum für Gestaltung, Stiftung Bauhaus Dessau and Klassik Stiftung Weimar, is the largest Bauhaus show in Britain in over 40 years, representing pieces from its radical founding in 1919 to its final closure in 1933, tracing the transitions in style, ideology and aesthetic through a chronological progression. The works featured include paintings, sculptures, photography, film, textiles, ceramics, theater and more—a diverse and expansive artistic output representing a period of high artistic innovation. From iconic Bauhaus master works to compositions by lesser known students, this exhibition encapsulates the notion of art as life, the inseparability of social community and artistic production, and the human experience of this artistic-social experiment. From furniture to puppetry, typography to photomontage, this diverse range of production signals the creative effluence from this beacon of modernism and avant-garde design in a show celebrating the playfulness of collaborative Bauhaus culture. The exhibition is divided into ten sections, chronologically ordered, spanning two floors and 16 rooms. The installation in the Barbican is the ideal setting for this vast retrospective of the modern school; the brutalist concrete aesthetic, divided into cubic units of open and closed spaces, embodies the spirit of the Bauhaus, even echoing the modular/interchangeable plan of the Bauhaus Building in Dessau–hailed as an apogee of modernist design. The space is curated with the creativity of the Bauhaus spirit, with temporary walls utilized to create environments at once unique and connected—slowing movement from room to room and highlighting transitional spaces with projected films or enlarged photographs. Ascending the stairs to the first unit, new beginnings, the viewer is introduced to the schools’ founding by Walter Gropius, merging the Academy of Fine Arts and the School of Applied Arts in Weimar in 1919. The utopian and socialist undercurrent of this radical development emerged from both political post-war attitudes, as well as reforms in arts and crafts in the wake of late nineteenth-century industrialization, uniting art, craft and design to ameliorate the socio-economic devastation of WWI. The reconciliation of mass-production and fine arts, the craft tradition with technological innovation, and a declaration of design as an agent of social liberation was mobilized to streamline functionality through simplified forms and production processes. 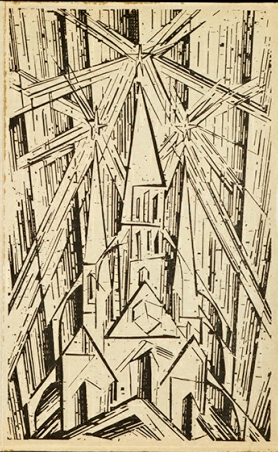 The early artifacts of Expressionism, such as the woodcuts of Lyonel Feininger, illustrate the beginning of a radical aesthetic trajectory. 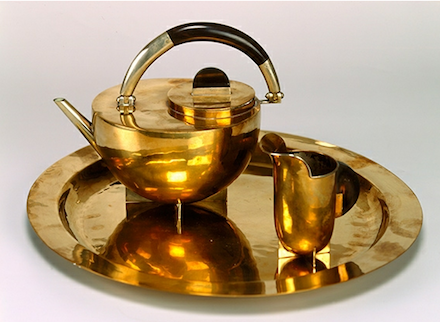 The following section, a return to the crafts, featuring textiles, furniture, pottery and metalwork, elucidates the diverse production resulting from the unity of Fine Arts with Arts and Crafts—Walter Gropius’ original pedagogical imperative and founding principles. Objects grown out of Johannes Itten’s preliminary course, concentrating on visual analysis (color, form and material studies), reveal the effort to eschew convention, to liberate a creative potential by unlearning the traditions of an earlier era. Co-taught workshops, doubly instructed by a master artist and craftsman, focused on stone and wood sculpture, cabinetry, glass, metal, pottery, weaving, printmaking, bookbinding, wall painting and stage—artifacts of which are displayed in states of experimentation as studies and as final products. The next section, salute to the square, encapsulates a transitional moment in Bauhaus aesthetics and imperatives, with a turn over in teaching faculty. 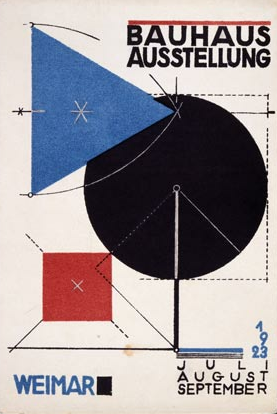 The Expressionist bent of early Bauhaus work evolved to demonstrate a more rational aesthetic inspired by industrial production with the arrival of Theo Van Doesberg, founder of De Stijl, and Moholy-Nagy, the Hungarian Constructivist, in 1923. The influences of Dutch Style and Russian Constructivism are evidenced by the hard edged geometry, block colors and squares present in many paintings and drawings of this section, replacing the evocative cathedrals and dense expressionistic paintings of early Feininger and Kandinsky. This section also contains advertisements for and works from the 1923 Bauhaus Exhibition, a declarative moment of the school’s new direction. Featuring demonstrations of student and teacher achievements, as well as prototypes of the Haus am Horn (the prefabricated house model), the famed lecture by Gropius “Art and Technology: A New Unity”, announced the emphasis on the potential of an industrial imperative of production. The postcard for the exhibition anticipates the new sparse aesthetic of this paradigmatic phase of the school. The subsequent section, instruments of communication, focuses on the typographic innovations that characterize this shift in style from early eclecticism to a new privileging of clarity and efficiency of communication. 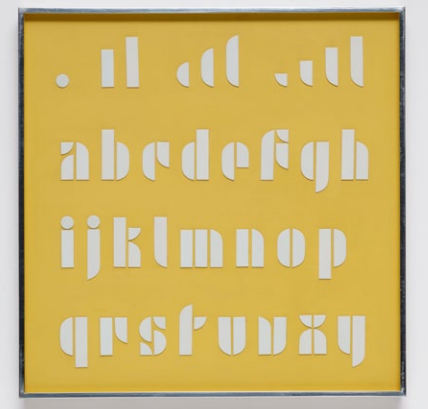 A room dedicated to typography, industrial production design and the Bauhaus Verlag (Bauhaus Press) showcases the simplified formal language and color schemes that were used to publicize the school and disseminate their ideas to a broad audience. Promotional magazines and books epitomize their modern, graphic identity, and reveal a new concern for advertising. Descending to the lower floor marks a thematic turn to the Dessau years; in 1925, the school was forced to relocate to the industrial town of Dessau under mounting financial and political pressures from the conservative Thuringian government. 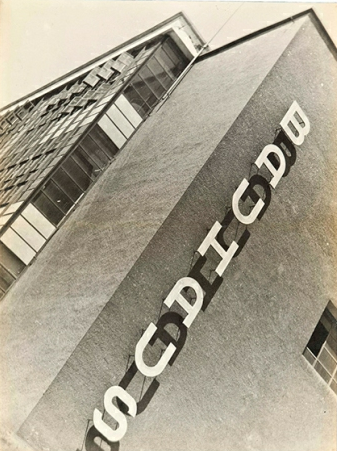 The new building, designed by Gropius, and now an icon of modernism and the Bauhaus style, encapsulated the functionality of design in its new aesthetic. 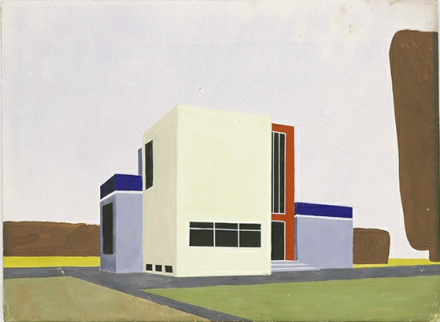 The flat-roofed, white cube with its glass-curtain facade, moveable walls to encourage collaboration, transparency and ingenuity, together with the adjoining Masters Houses, are conjured through drawings, architectural plans and photographs that bespeak the model of efficiency embedded within this modernist design scheme. A film titled, ‘How do we live in a healthy and economic way?’ features the conveniences of the new domestic design, such as bendable lamps and transformative furniture. Interior decoration, furniture, and fixtures to complement the architecture were completed in Bauhaus workshops, now divided into departments for cabinetry, metal, wall painting, weaving and printing. Marcel Breuer’s iconic tubular furniture, such as the Wassily chair, is displayed in front of large-scale images of these interiors to recreate this modern space, highlighting their human functionality as well as aesthetic order. 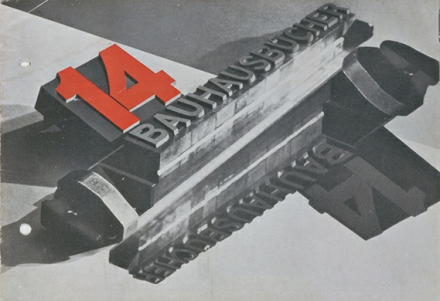 This section, young people come to the Bauhaus!, which takes its name from the German “junge menschen kommt and Bauhaus!” —a line from the cover of the Bauhaus Prospectus—reiterates the industrious imperative of Bauhaus training as well as the attempt to disseminate artistic philosophy through advertising and design. The following section, our play, our party, our work, shifts focus from the production of goods to the importance of community and the Bauhaus as a social collective. Party invitations, photographs of events and festivities, even gifts once shared between students and colleagues are showcased to intimate the lively social component integral to creation at the school. Photographs of costumes for the Metal Party, with students decked out in spoons and pots, highlight the whimsical creative outlet that these parties occasioned. 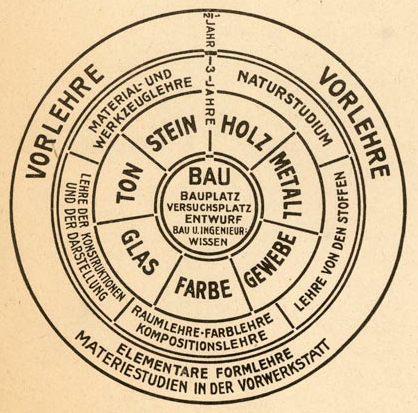 A large portion of the lower floor is dedicated to photography—a growing department within the school, and a wonderful documentation of daily life at the Bauhaus. 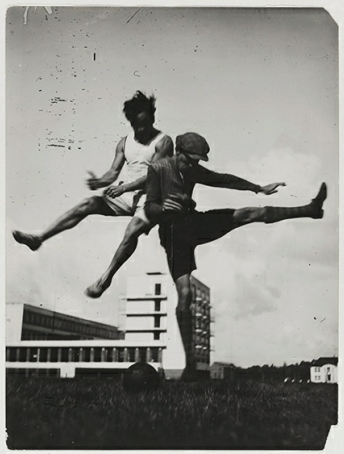 Intimate portraits of the masters and students by Lucia Moholy, juxtaposed with playful shots of students working and having fun give us a view into the dynamic quotidian existence of this radical community, and highlight the inseparability of artistic production and Bauhaus living. A new theatrical emphasis illuminates the spectacular seamlessness of art and life, where performances served as a metaphor for art as life itself. Theater functioned as a social agent within school life, with performances enacted on balconies, rooftops and the communal canteen—experiments with movement, space, the human form, sound. 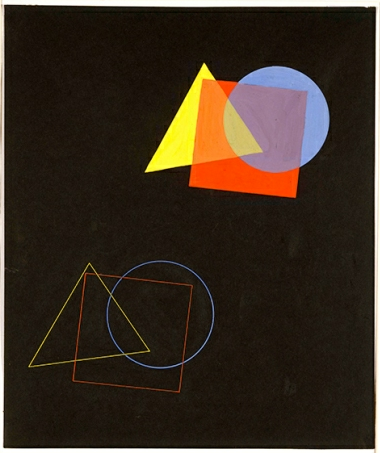 Oskar Schlemmer’s famous Triadic Ballet costumes are displayed on a spot-lit stage in the section titled, stage, space, architecture, that demonstrates the unity amongst all arts as a Gesamkunstwerk (total work of art) of painting, sculpture, architecture, music and dance, creating what Kandisnky hailed “a monumental abstract art”. The next section, designing the modern world, embodies the change in curriculum in the summer of 1927 to the core areas of architecture, advertising, the stage, and free art. Experiments in material, texture, light, color and form, both technological and theoretical in their aesthetic principles, emboldened the design and production of workshop prototypes and large scale commercial projects that ultimately provided much needed revenue for the school. 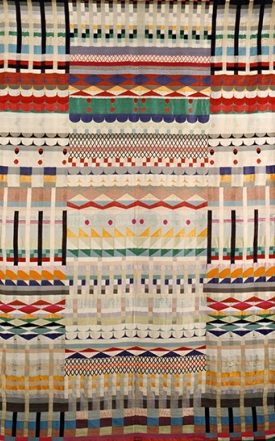 The most lucrative source of production for the school was wallpaper and textiles, with a weaving workshop headed by Gunta Stözl. 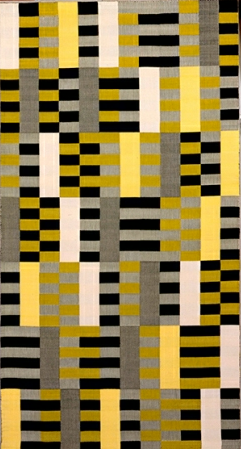 Examples of the fabrics, systematically woven and dyed, as well as clothing, Bauhaus dress, are exhibited here. The photographs that documented daily life are followed in the ninth section, the new vision, by the experimental innovations in photography in the late twenties and early thirties. The 1929 establishment of a photography department within advertising focused on technical, optical and chemical processes. This section displays the experiments in photography of Moholy-Nagy, who created a wealth of surprising photograms and photomontage, inspiring other Bauhausler to experiment with the medium. The use of photography in advertising and publishing is paired with creative studies using new techniques and approaches. The last room, the final years, illustrates the demise of the school in the wake of political and financial circumstances. The ultimate director, Mies van der Rohe, who privileged professional training in architecture and design over the political socialist orientation of his Communist predecessor Hannes Meyer, was yet unable to escape the pressures of the Nationalist government, who cut funding and instigated a three-month shut-down of the school, now in Berlin, forcing its final closure in 1933. Van der Rohe’s letter to the students announcing its extinction is displayed in a vitrine in this final gallery amongst architectural plans and photographs. The last object is Kandinsky’s painting ‘Development in Brown’ from 1933, described in the wall text as a symbol of hope, an allegory of the international future of the Bauhaus in light of the political circumstances that forced its end. The curatorial text alludes to the dissemination of Bauhaus philosophy through the emigration and dispersal of its students and teachers during the war, announcing its definitive impact on design and architecture throughout the twentieth century and today. This exhibit reiterates the iconic status of the Bauhaus as a stronghold of modernist design philosophy, yet seeks to enrich this view through the personal lives of its collective society. 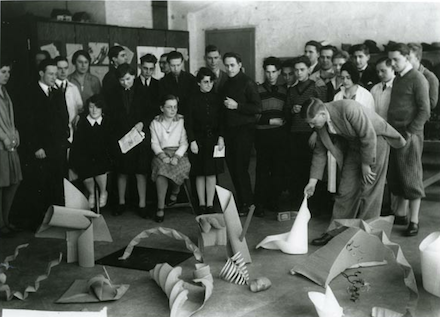 Rooms full of color theory exercises from Paul Klee and Kandinsky’s preliminary courses, texture studies with folded paper and manipulated mesh wires, and light and material experiments from Moholy-Nagy’s course give insight onto the student’s training and models. Vitrines with paper ephemera, brochures, booklets and printed matter throughout the galleries trace the development of a distinct style and typographic impulse. 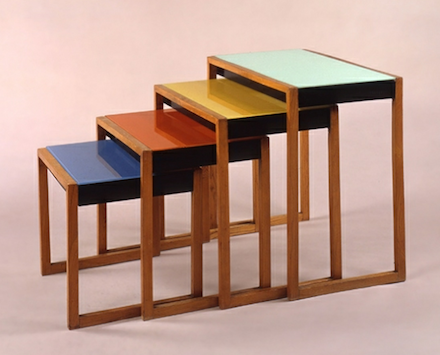 Furniture displays of Breuer and Albers, great wall hangings that expose the systematization of textile weaving by Anni Albers and Gunta Stözl, Wagenfeld lamps and Marianne Brandt tea pots—each contributing to this dense treasury of an industrial imperative enlightened by intelligent and creative design, and moreover, a playful existence. This entry was posted on Friday, June 8th, 2012 at 2:24 am	and is filed under Art News. You can follow any responses to this entry through the RSS 2.0 feed. You can leave a response, or trackback from your own site.